I have a confession to make, I have hardly been active in Google Plus as I am a Facebook person but…. Google+ is the ONLY content based Social Network which indexes AND ranks your posts? From an SEO point of view, this is invaluable! Google+ has now overtaken both Twitter and LinkedIn, to become the 2nd largest Social Network – with over 360M Users! Now that’s a hefty number of potential customers left untapped. Unlike Facebook, Google+ has the power of the world’s largest search engine behind it, Google! This means that Google looks upon content from your Google+ page more favorably than it does from other sources – therefore ranking it higher [usually page 1!] in search. Of course, it is never as simple as it sounds – and there is so much more to Google+ than first thought and it can be so confusing. Take their largest competitor, Facebook, for example… Facebook’s post reach is dropping dramatically day by day, and there is a much greater need for us marketers having to pay to advertise on Facebook to get our message seen! With Google+, your message can be seen, not only by your network of contacts but by your ‘contact’s network’ too! This is just ONE reason why more and more smart marketers are moving over to use Google+. Not only that, but Google+ is fully integrated with all other Google properties; Google Search, YouTube, Gmail, Google Hangouts, Google Docs etc… making it not just a Social network, but a Social Layer – which means just one thing, greater visibility for you and your business! How many hours per week do you spend on Facebook, either marketing or networking? This product has been created to help you build your authority using this, perhaps unfamiliar, but powerful social platform. It takes you from complete basics, right through to helping you and your business become an authority, get found and make money using Google+. 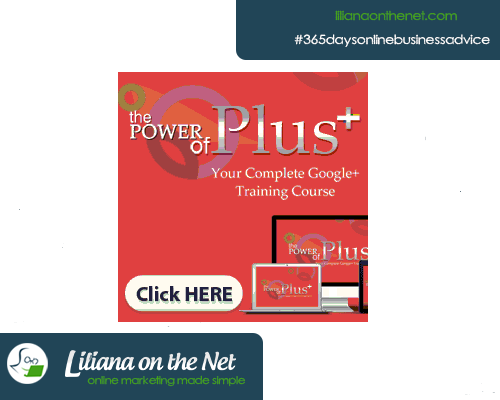 The Power Of Plus really is your complete Google+ training course – containing over 26 training videos, full transcripts, checklists, mind maps and some quality bonuses too, a complete over delivery for the price and one that I highly recommend you check out. Looks like a great resource – thank you for sharing! I use G+, but have a lot to learn about how to use it to the best effect. Laurel Regan recently posted…How do you write? Hi thanks. Sue and her product really make it easier. I remember when I was learning my way through FB, it would have been so much easier with a product like this. Thanks. I have a G+page, but I don’t tend to post there or do anything with it. Based on all that you’ve shared here, there is power in G+ and I don’t want to miss out anymore. It makes sense that G+ will really take on Facebook. They have the most powerful search engine already.